It would be a mistake to write too much into Fountains of Wayne. It would require a level of brooding self-absorption beyond my kin to turn this band into any sort of harbinger of meaning. They just don’t write that kind of music. They write upbeat, mid-tempo guitar pop flushed out with generous portions of retro-80s synthesizer. They use handclap percussion, three part harmonies, copious amounts of “OOOOOOOOs” and “AAAAHHHHHHHs” and classic pop hooks; many, many hooks. It’s like a fishing supply store there are so many hooks. All of this wraps around Chris Collingwood’s simile heavy vocals to create the smirkiest pop you’re ever likely to love. Collingwood writes lyrics seeped in overly literate, bored suburban passive aggression, a theme he had perfected on the band’s self-titled debut back in 1996 and that has carried through the band’s entire catalogue. There’s a shimmer of smirking in-joke behind virtually every track. It’s the kind of thing that, in the wrong hands, turns otherwise decent bands into self-reflective parodies of themselves. Think Nerf Herder. Luckily Fountains of Wayne usually manage to skirt that particular pratfall, never allowing their amusement at their own wittiness to overpower the need to write songs accessible to non-in-crowd audiences. Now, if you’re just not into guitar pop, or if quirky wordsmithing isn’t in your top five reasons to listen to a band, these guys are not likely to entertain you very much. There’s not much here you haven’t heard before, sonically. The melodies are your basic major key progressions, chorded, often fuzzed, but sometimes simply amplified acoustics. The rhythms almost never venture out of the slow- to mid-tempo straight time. 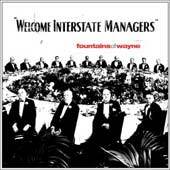 There is nothing even vaguely experimental or avant about the band or its music.. You’ve likely heard something very similar to the soundscapes on Welcome Interstate Managers before. No one should listen to the Fountains of Wayne looking for expansive adventures in audio. But if you just enjoy solid to great pop songwriting, if you hum along at the desk or sing your way through the daily commute, if Gen-X word play amuses, it’s more than worth the chance. Standout tracks include the opener Mexican Wine, as well as Bright Future in Sales and Little Red Light. …Sales is a brilliant deconstruction of post-Gen-X angst playing itself out in the Arthur Miller’s shadow, the other two are just brilliant love songs of a type. Hey Julie and Bought for a Song are also solid-to-great offerings, and while it's countrified tinge might set some listeners aback considering the context, Hung up on You is very good on its own merits. Bought for a Song is my favorite track due to its just-beneath-the-surface anger and general crunch, and reference to “sake in aluminum cans.” I could live without Halley’s Waitress and Fire Island, but I’ve always been less impressed by the band’s balladeering than with their faster paced songs. Your mileage may vary, of course. All in all, I give Welcome Interstate Managers five sponges. It’s not going to change you mind if you’re zombie-minded out by Radiohead’s latest; nor is it going to replace My Bloody Valentine in many CD changers. But it can entertain for weeks if you’re just looking for the lonesome art of pop, and that’s worthy the ticket price for me.